"I'm working with Teck Resources Inc. as a contracted employee of Alaska Earth Sciences at the Red Dog Mine. Alaska Earth Sciences is a small, Anchorage-based geology company that contracts employees to many projects while having their own projects on the side. Teck Resources Inc. is a major mineral exploration company based in Vancouver, BC that has projects world wide. This year, I'm logging exploration drill core from the Noatak Exploration Project on the Red Dog Mine property. My duties include interpretting the core, drawing cross-sections, visiting the drill site occasionally (via helicopter), and the occasional field day, either mapping or soil sampling. 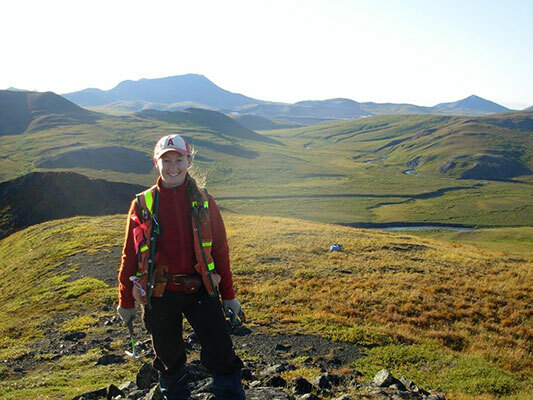 The picture at the left is of me in the field with the mine in the background ..."
Kacie Wellington's recent successes remind us how the Minerals Resource industry remains a robust career path for our graduates. The Geology Department continues to offer separate courses in Ore Deposits and Exploration/Mining Geology. We are devloping a network of contacts with the mining industry that have recently yielded valuable work experiences for our students (e.g., internships leading to full-time jobs).